Two days ago a huge earthquake, registering 8.8 on the Richter scale, hit Chile. This was one of the most powerful earthquakes ever recorded. Tsunami alerts were issued but, luckily, no reported major damage resulted from tsunamis although even Hawaii was under a tsunami watch. Tremors were felt as far as Buenos Aires, Argentina, and Sao Paolo, Brazil. Aftershocks have followed. However *** this is an update to this post that was written yesterday *** cnn.com is reporting that some of the deaths in Chile in coastal communities may have been due to the government not issuing a tsunami warning to Chile residents, in time. According to an article by Marc Lacey in The New York Times, the President of Chile, Michelle Bachelet, called the damage caused by the quake an emergency unparalleled in the history of Chile and suggested that the death toll would likely spiral higher in the days ahead, with the toll now already over 700. It seems that President Bachelet is well in control of this catastrophe, which has downed power lines, destroyed bridges, toppled buildings and cars, and resulted in the closure of the Santiago airport. President Bachelet realizes the critical importance of restoring electric power since communications and medical delivery depend on it. She has arranged with supermarkets to have people take food and water, at will. Chile has better building standards than Haiti, whose population suffered tremendously when the earthquake hit it on January 12, 2010, with more than 200,000 estimated deaths. According to The Times, the epicenter of this Chilean earthquake was farther from populated areas, than in the case of Haiti, with its capital of Port-au-Prince, in shambles, so the scale of the damage from Chile’s significantly more powerful earthquake is expected to be nowhere near that suffered in Haiti. My college room-mate at Brown University, Maria Teresa Davila, was from Chile, so I learned a lot about this mountainous country from her. She was also an Applied Math major and loved operations research (as did I). Interestingly, Andrew Revkin, also a fellow Brown University grad, and a New York Times journalist, writes about how the Chilean Earthquake is a Warning to the U.S.. Northwest. My daughter predicted what the score would be for the men's hockey final game today at the Olympics with a score of 3-2 even before the game started but she was expecting/hoping that the US would be the victor and get the gold medal. We watched the game until the US tied the game with 2-2 with only seconds remaining and did we cheer! Then the game went into overtime (but it was time to drive her to the rink where she teaches Basic Skills in skating and skates herself). We heard the news when we returned home and saw the Canadian men's hockey team with their gold medals and the US men skating off the ice looking pretty dejected. The New York Times already posted an article on this intense game, which concluded these 2010 Winter Olympics in Vancouver. It also has a graphic of the medal talleys for various countries with the US garnering the largest number of medals with 37; Germany, in second place with 30, and Canada, in third with 26 (not bad for all that this country and its people invested in these games). In fact, Canada won 14 gold medals at these Olympics (the most of any country), whereas the US won 9, as did Norway, with Germany getting 10 gold medals. I was born in Canada so I am pleased that these games, overall, were quite successful and filled with many wonderful athletic memories. At the same time, we saw tremendous courage in such athletes as Joannie Rochette, whose mother passed away in Vancouver just 2 days before Joannie skated her short program. Joannie, who is from eastern Canada, went on to win the bronze medal in women's figure skating this past Thursday. She is a true heroine and Olympian. These Games were marred by the death of the Georgian luger, Nodar Kumaritashvili, at age 21, during a training practice run, just hours before the opening ceremonies. Many of the male hockey Olympic medalists (especially the gold and silver medalists) will very soon be back with their NHL teams and the figure skaters will be getting ready to compete again in the 2010 World Figure Skating Championship that will take place in late March in Turin, Italy. Dr. Alan J. Goldman died a few days ago. He was well-known in operations research for his fundamental contributions and for his support of many researchers in this field, going back to his days at the National Bureau of Standards, now the National Institute of Standards and Technology (NIST), where he worked for over twenty years. Afterwards, he was a Professor in the Department of Mathematical Sciences (now called the Department of Applied Mathematics and Statistics) at Johns Hopkins University in Baltimore, Maryland, where he served on the faculty for over thirty years, including as an emeritus professor. Dr. Goldman was elected into the National Academy of Engineering (NAE) in 1989. The Johns Hopkins University newspaper published a very nice obituary on Professor Goldman. The article has an elegant way of summarizing the discipline of operations research as: the use of mathematics to improve decisions on the design and operation of complex systems. My doctoral dissertation advisor at Brown University was Professor Stella Dafermos, who, interestingly, received her PhD from Johns Hopkins University in 1968. She was the second female to receive a PhD in Operations Research in the world. I was invited, upon her untimely death at age 49, to write her obituary for the top journal, Operations Research, when she died in April 1990. Hard to believe that almost 20 years have passed since her death. As an aside, I might add that all of her four doctoral students have now achieved the rank of Full Professor, with Professor Steve McKelvey of St. Olaf College achieving this rank just this past week! Interestingly, the first paper that Stella Dafermos published, which was with her dissertation advisor, Professor F. Tom Sparrow of Hopkins, entitled, "The Traffic Assignment Problem for a General Network," which appeared in the Journal of Research of the National Bureau of Standards, volume 73B, 1969, acknowledges Dr. Goldman. The footnote on the first page at the bottom of the paper reads: This work was undertaken under contract CST-1278 with the National Bureau of Standards. We wish to acknowledge the many constructive comments of Alan Goldman of the Applied Mathematics Division of the Bureau, and Dr. George Nemhauser of Johns Hopkins University. Nemhauser is very well-known in the operations research (OR) community (and is also a member of NAE); after Hopkins, Nemhauser spent time at Cornell, and then moved to Georgia Tech. The Johns Hopkins University obituary of Professor Goldman notes that over a dozen doctoral students worked under his supervision. I might add that one of them is my colleague, Professor Alan G. Robinson, of the Department of Finance and Operations Management at the Isenberg School of Management at UMass Amherst. The academic community is such a "small world!" Professor F. Tom Sparrow moved from Hopkins to Purdue University and has since retired. The New York Times should be commended for publishing not one but two articles on sustainable supply chains and transportation in the same issue! Yesterday, in its Business Day section, The Times had an article, Clearing the Air at American Ports, written by Steven Greenhouse (appropriate name for this topic) and Wal-Mart Plans to Make its Supply Chain Greener by Stephanie Rosenbloom. The former article discusses how the ports of LA and Long Beach are the single largest contributors to air pollution in the Los Angeles area, due to diesel pollution, and how a unique partnership, a labor-green alliance, is looking to prevent old trucks, which generate greater levels of emissions, from hauling cargo from the ports. The burden of replacing the older trucks with new trucks, which emit fewer emissions, is to be placed on the trucking companies, rather than on the individual truckers, many of whom, because of the large costs, are just barely eking out a living. The article on Wal-Mart, in turn, emphasizes how Wal-Mart is working with suppliers to reduce greenhouse gas emissions in its supply chain to a tune of 20 million metric tons by 2015 (which would be equivalent to removing more than 3.8 million cars from roads for one year)! Suppliers are to examine the complete carbon lifecycle of their product -- from the manufacturing and use of raw materials through the recycling stage. Given Wal-Mart's clout and heft, as well as its growing emphasis on sustainability, such initiatives are proactive and timely (and also help to reduce energy costs). We have been conducting research on sustainable supply chains and transportation for many years and have published articles (and even books) on such topics. In 2007, I wrote the article, "Sustainable Supply Chain and Transportation Networks," with Dr. Zugang "Leo" Liu and Dr. Trisha Woolley, two of my former doctoral students, who are now, respectively, professors at Pennsylvania State University at Hazelton, and at Texas Wesleyan University in Fort Worth. This article, which appeared in the inaugural issue of the journal, International Journal of Sustainable Transportation, is available for downloading for free from the journal's website. Our article demonstrates how competition among decision-makers in supply chains, who are multicriteria decision-makers, and interested in reducing emissions, can be combined with collaboration across successive tiers of the supply chain. Hence, this framework allows for the determination of the ultimate supply chain network design for sustainability in the case of alliances and partnerships, as we have been reading more and more about in the press. This article of ours is one in a series on sustainability, supply chain networks and transportation, which can be accessed on the Virtual Center for Supernetworks (please use Internet Explorer or update your Mozilla browser for downloading of pdf files from this site). Last evening, Apolo Ohno made Olympic history by becoming the first US Olympian to secure 8 medals in Winter Olympic Games and he did it in the sport of speedskating. He did it with his characteristic aplomb, by overcoming adversity, on and off the ice, and by rising to all the challenges. This article on CNN.com discusses his victory yesterday, which happened after another short track skating event in which there were multiple crashes and his placement did not count (he was disqualified). His father, Yuki Ohno, who raised Apolo, after his mother left the family when he was a toddler also should be commended for helping to steer him on the right track and for dedicating so much of his own life to the dreams of his son, who has now made Olympic history. I am sure that we will be hearing more about Ohno in the future, perhaps in different metamorphoses. For now, he deserves congratulations and he and his US speed skating time some time spent on celebrating their magnificent victories! I always say that I have the best students! I teach at the Isenberg School of Management at UMass Amherst and one needs to be very flexible as an academic because one never knows what "opportunities" cross one's path on any given day. For example, as part of a development effort, I was asked to gather a group of my students for a photoshoot, which took place today and took over an hour. It was a new experience for my undergraduates, all seniors, which took part (but not for me), and they graciously gave up part of their Friday morning (during midterm time) to be photographed with me. Afterwards (I like to schedule such opportunities/events efficiently), a group of us (we were all nicely dressed for the photoshoot) took part in a videotaping in my research lab, the Supernetworks Lab for Computation and Visualization, which is part of the Virtual Center for Supernetworks, that I direct. My research team was selected to be part of a video that will be entered into a competition. This was another "good cause," so I obliged. As one of my undergrads today said, after we were photographed, numerous times, "if we don't get a job in business, we can always be models." My students are already model students and now they are even models! Above are some photos that I took this morning -- before even any of the official ones get processed. The female figure skating competition at the 2010 Winter Olympics is now over with the long program completed last night in Vancouver. Kim Yu-Na of South Korea, who is coached by the Canadian, Brian Orser, scored a record number of points during the competition, and received the gold medal, followed by Mao Asada of Japan, with the silver medal, and Joannie Rochette of Canada, with the bronze. Joannie Rochette's mother passed away last Sunday of a massive heart attack at age 55, shortly after arriving in Vancouver to watch the Olympic Games. Joannie competed two days afterwards in the short program and last night clinched the bronze medal. To be able to compete and to excel, under such trying circumstances, is the mark of a true Olympian and a champion. Joannie said that she tried to make her mother proud. Joannie's mother had told her a week ago that she was certain that she would receive a medal at the Olympics. Our hearts go out to Joannie and to her father, Normand Rochette, for their tremendous loss. Rachel Flatts, the American figure skater, who is 17 years old, and about whom I have written in an earlier post, placed 7th (she was downgraded several points, for reasons not completely clear), but, nevertheless, she received her first acceptance letter from a college and it was from Stanford University! Nagasu, her teammate, placed 4th, which is also a great achievement. One skater, whose specialness also showed on the ice, was the skater who represents Turkey, Tugba Karademir. Her parents gave up their great professions and careers in Turkey and moved to Canada so that she could train there. 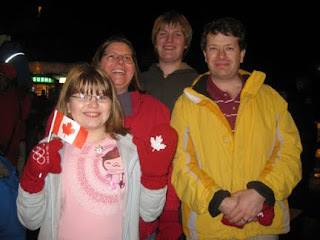 Some generous benefactor paid for them to be able to attend the games in Vancouver (they could not afford to see her skate at the Winter Olympics in Torino 4 years ago). It was very special to see her parents smiling and waving the Turkish flag in the stands as they cheered their daughter on. The complete female figure skating results can be found here. Speaking of another "on the ice" competition at the Vancouver Olympics yesterday, the US women's hockey team was beaten by Canada in the finals. The Olympic US women's hockey team has many players who played on prep school high school teams in the Northeast and several who went to Harvard. Nevertheless, the US team garnered a silver medal! As the Olympics start drawing to a close we extend our heartiest congratulations to all the competitors! Transportation Network and Supply Chain Design Talks are Now Online! Talks, in pdf format, on transportation network design and supply chain network design, given at the Symposium on Transportation Network Design and Economics, at Northwestern University last month, in honor of the visit of Professor Martin Beckmann, are now online. Professor Hani S. Mahmassani, the Director of the Transportation Center at Northwestern University, and Professor David E. Boyce organized this symposium, which was very successful and generated numerous discussions and research ideas. Professor Ouyang's talk and my talk focused on supply chain network design. My presentation was based on the paper with the same name as my presentation, which was just published in 2010 in the journal, Transportation Research E.
Professor Boyce gave a fascinating historical perspective on road network design with applications to the Chicago area (and beyond). Professor McDonald spoke on different means of traffic mitigation, whereas Professor Nie discussed pricing and refunding in transportation networks (both very hot topics now). Professor Kim discussed, from his unique, international perspective, how ICT (information, communication, and transportation) technologies can assist in the problems that cities are facing. Professor Brockmann gave a physicist's perspective on human mobility and complex network theory (a topic also of great interest to me). Professor Klabjan spoke on the work that he is interested in regarding modeling the carbon footprint in logistics and the challenges faced by the trucking industry in determining what part of the load contributes what amount to emissions (and who, hence, should pay). Many thanks to the symposium organizers for putting up these presentations so that anyone interested may benefit from them! Today we are experiencing frightful winter weather in Amherst with heavy wet snow, downed trees, and with numerous electric power outages and with many schools and colleges closed. This kind of weather demonstrates how important the generation and delivery of electric power is to our homes, businesses, and not to mention to our schools and hospitals. Several of my doctoral students have conducted research on electric power generation and distribution networks, which we also established have commonalities with transportation networks. Most recently, a former student of mine, Dr. Zugang "Leo" Liu, and I had one of our papers, "An Integrated Electric Power Supply Chain and Fuel Market Network Framework: Theoretical Modeling with Empirical Analysis for New England," published in the journal, Naval Research Logistics. This paper used data from ISO - New England. ISO - New England (NE), according to its website: helps protect the health of New England's economy and the well-being of its people by ensuring the constant availability of electricity, today and for future generations. ISO New England meets this obligation in three ways: by ensuring the day-to-day reliable operation of New England's bulk power generation and transmission system, by overseeing and ensuring the fair administration of the region's wholesale electricity markets, and by managing comprehensive, regional planning processes. This ISO (independent system operator) has numerous important roles. We are delighted that we will be hosting the talk of Mr. Richard Brooks of ISO - NE on Smart Grids, next Friday, March 5, 2010, in our Speaker Series. This Series is organized by the UMass Amherst Student Chapter of INFORMS, which I have been serving as the Faculty Advisor of since 2004. More information about Mr. Brooks' presentation, and other upcoming talks, can be found on this link. The students have added a nice slide show on the chapter website, so do check it out if you have a chance. Mr. Brooks' presentation will take place at the Isenberg School of Management at UMass Amherst next Friday, in Room 112, at 11AM. This talk, as others in this series, is open to the public. Please join us, if you can, and learn about a most important topic -- that of smart electric power grids! The ice dancing competition is now over at the 2010 Winter Olympics and the Canadians (Virtue and Moir) received a gold medal with the US (Davis and White), the silver, and the Russians (Dominina and Shabalin), the bronze. The renowned and magnificent ice dancers, Tanith Belbin and Ben Agosto, placed fourth but are still Olympians. Tonight the short program of the women's figure skating competition takes place in Vancouver. The media coverage has been fascinating in print, TV, and online. To achieve greatness in sport (and in anything, frankly) hard work, discipline, focus, and dedication are number 1 (but some talent and luck help as well). In figure skating, it is not uncommon for skaters to be homeschooled so that they focus entirely on their chosen sport. Sometimes, however, this approach can lead to burnout, and to injuries, although the training that is needed to excel in this difficult sport is immense. Balance (not a pun) is important and Rachel Flatts, the 17 year old figure skater from Colorado Springs, who will be competing for the US tonight in Vancouver, is the picture of efficiency, on ice and off it, according to a great article in The New York Times. What is especially impressive is her dedication to her schoolwork at Cheyenne Mountain High School, which she attends and takes 4 AP courses at, while maintaining an A average. We have relatives in Colorado Springs and have seen the school and my daughter has even skated at the Olympic training facility in Colorado Springs, where Rachel trains. Rachel's parents are accomplished. Her mother is a retired scientist and her father is a president of a biofuels company. Rachel's mother, Jody Flatts, is quoted in the Times article as saying, Other families have their girls home-schooled or taking classes on the Internet, but we never put Rachael’s education on the back burner for skating. School isn’t a backup plan. It’s a life plan. What a wonderful quote! Best of luck to Rachel Flatts and the other female skaters tonight and on Thursday night in the long program! This morning, one of the associates of the Virtual Center for Supernetworks, who was working on a grant proposal, emailed me to inform me that he could not download pdf files from the Center's Website. I then emailed several other associates and received mixed responses. Notice that this is on a Sunday. Since I could not recreate the problem on my computer, nor could my husband on his, nor could our daughter on hers (she uses a MAC rather than a PC), my husband turned to our travel computer, an old Toshiba. (I am risk-averse and, although it's backed up, I do not like to carry my laptop with all my work on it when I travel!) Lo and behold, when I tried to use Firefox to download an article from the center's website, it went into never-neverland. After doing a quick web search, I found that this problem was mentioned more times than I care to know about and that there were more possible causes/solutions than I would care to decipher. The consensus, however, seemed to be that if Firefox uses its built-in pdf reader, there are certain pdf files that crash the reader giving a "stopped" message at the bottom. While sometimes hitting the back button and restarting would clear the problem (noted by one of my hard-working doctoral students who had figured this out last week), this approach would not always work. Since many of my files are generated using the pdf generators in PCTeX and OpenOffice, I have no idea if there is a quirk between how those generate pdfs as compared to those generated by Adobe Acrobat. The consensus solution (nothing like the wisdom of intelligent, geeky crowds), however, was to go to the tools menu of Firefox and, under options, change the program associated with pdf files to Adobe Reader. Changing this option cleared up the problem on my travel laptop, for the associate who originally contacted me this morning, and for several others! On my usual computer and my husband's computer the association had already been changed which, I presume, is why we never saw the problem in the first place. With computers, it may be several hours gone and only tiny steps forward. However, I managed to also get a neat code working today for an algorithm implementation for a network optimization model, and that was, in contrast, great fun and rewarding (but, then again, I had full control over that work and my progress)! Dr. Luther Luedtke is featured in today's New York Times in a wonderful interview, entitled, "Educator to the World," as told to Patricia R. Olsen. He is the President and CEO of the Newton-based nonprofit organization, Education Development Center, Inc., (EDC), which develops programs to solve economic, health and education problems in the United States and around the world. It has employees in 35 countries. Dr. Luedtke has had a very interesting career path, beginning with the study of accounting and economics, and receiving a PhD from Brown University (my alma mater) in American Civilization. He has served as chair of a department at USC and was president of a university. He says that he loves to solve problems and to "fix things." Throughout his career he has exhibited outstanding managerial skills (something that you need if you are a researcher at a university with a cadre of students or an academic administrator). In the interview, Dr. Luedtke also mentioned that he was a Fulbrighter twice (as was I) and he acknowledges the impact on his life that his elementary school teacher, Mrs. Carlson, had. You can read about some of the very interesting projects that the Education Development Center is engaged in here. Great educators make a lasting impact and it is very neat and inspirational to see how EDC contributes to global education outside the formal academic setting. Also, how nice that a CEO still acknowledges the influence of one of his teachers, Mrs. Carlson! Yesterday, Dr. Mzamo Mangaliso gave the inaugural talk in our Spring 2010 Speaker Series in Operations Research / Management Sciences. Dr. Mangaliso served for two years as the head of the National Research Foundation, which is South Africa's counterpart of the US-based National Science Foundation. His talk was fascinating and during it we "journeyed" to South Africa and learned about the Strategic Plan that he spearheaded for building the research capacity in science for South Africa. Part of the strategic plan included the production of more PhDs in science, the creation of new centers of excellence, more transparency in grantsmanship, and even a system of nationally chaired professors (what a great idea and more on this below)! The discussions that followed his talk were very spirited and those in the audience included faculty, students, and guests from industry. Dr. Mangaliso was asked how to justify to politicians, for example, that producing more PhDs has benefits when there are so many other problems (with housing, poverty, crime, diseases, etc.) that South Africa faces? An economics professor then interjected that in producing a PhD the marginal cost is low because that PhD may start a company, educate many others, etc., whereas if you just produce 1 house only 1 person (plus maybe his family) benefits. There were also interesting questions regarding whether tech transfer and innovation is a better measure of capacity building than the number of journal citations. We also got a wonderful education on "Ubuntu," and I am not speaking of the Linux operating system, but, rather, according to South Africans, it is defined as humaneness -- a pervasive spirit of caring and community, harmony and hospitality, respect and responsiveness -- that individuals and groups display for one another. Professor Mangaliso has written about ubuntu and what it can do for workers and companies (really interesting ideas and viewpoints on teams, efficiency, and decision making). Speaking of teams, Professor Mangaliso provided us with the link of an interview with Doc Rivers, the coach of the Massachusetts-based professional basketball team, the Celtics, and what ubuntu means to him and the Celtics. Listen to the 3 minute interview here. During the lunch that followed Professor Mangaliso's lecture, we further discussed academic career paths and wondered why in the US it seems that sooner or later certain faculty get asked to serve in or are recruited for (I have been multiple times) administrative posts. What if research is what you really love to do and teaching (there is already too much service that some of us end up doing but who will do it otherwise)? Shouldn't there be a career track in a country that values knowledge creation and innovation that allows one to continue to do research? Dr. Mangaliso had met with the Director of the NSF, Dr. Arden Bement, while he was at the NRF to discuss what he was doing at the NRF and the various components of the strategic plan that was being developed. Wouldn't it be terrific if the US started national chaired professorships to keep some of the brightest minds in research?! Above is a photo of Professor Mangaliso at his talk yesterday at the Isenberg School of Management with two of the UMass Amherst INFORMS Student Chapter officers who helped to host him. Congratulations to Newly Inducted Members of the National Academy of Engineering (who are also INFORMS Members)! The National Academy of Engineering (NAE) has announced the newly elected members for 2010. This group includes INFORMS (Institute for Operations Research and the Management Sciences) members: Dr. Cynthia Barnhart, the Associate Dean of Engineering at MIT, Dr. Hau Lee, of the Stanford Graduate School of Business, and the former editor of the journal Management Science, and Dr. William Pulleyblank, a Vice President of IBM. Dr. Barnhart spoke in the Speaker Series that the UMass Amherst INFORMS Student Chapter and I organize (in our Fall 2006 Series). It was a pleasure to host her. Dr. Barnhart is a past President of INFORMS. Congratulations to all the newly elected members! Miracle in Vancouver -- Evan Lysacek Gets the Gold in Men's Figure Skating! For the first time since 1988, a Russian did not win the gold medal in men's figure skating at the Winter Olympics, and the American, Evan Lysacek, stood at the top of the medal's podium at the 2010 Winter Olympics in Vancouver. This is not quite like the Miracle on Ice, a theme I have written about, when the US men's hockey team received the gold at the 1980 Winter Olympics in Lake Placid, but close! According to The New York Times, when the final scores were posted, Carroll turned to Evan Lysacek and said: My God, you’re the gold medalist! You are the Olympic champion! They hugged. Congratulations to both of them for their incredibly hard work, discipline, dedication, determination, and for believing that technical mastery and artistry would yield the top prize in figure skating! Kudos also to Johnny Weir who skated beautifully and who earned 6th place. Yes, Evan Lysacek, despite not doing a quad, got the gold, and Plushenko, of Russia, got the silver. Takahashi of Japan was the bronze medalist. Time to celebrate the comeback of US Figure Skating! Maersk, the Danish shipping company, has greatly reduced its long distance ship speeds (including on trips from Germany to China) in order to reduce emissions. At the same time, even with greater employee costs that such trips entail, it has reduced its total costs. Slowing down from high speeds reduces emissions because it reduces drag and friction as ships plow through the water. That principle holds true in the air and on land. Planes could easily reduce emissions by slowing down 10 percent, for example, adding just five or six minutes to a flight between New York and Boston or Copenhagen and Brussels. Maersk should be commended for having the guts to go against the grain as a company and for being so proactive in helping the environment. My research team has been investigating environmental issues that firms are faced with from how to create cost and environmental synergies in mergers and acquisitions, to the evaluation of cap and trade schemes and carbon taxes, to the effects of the deterioration of roads on emissions, to the optimal design of sustainable supply chain networks (something which an expert in the same article implies is hard to do), among just a few topics. You may find some of our latest research on the website of the Virtual Center for Supernetworks. In the meantime, it makes sense to, literally, take the slow boat (and plane) to China. Finally, someone understands that I am in "good company." USA Today reports that several parents of Olympic figure skaters can't bear to watch their child compete in events and that includes the mother of Evan Lysacek, who is second in the 2010 Winter Olympics after the men's short program in figure skating with the finals taking place today in Vanouver. I plan on watching him compete against Plushenko of Russia, who is in first place after the short program and against Johnny Weir, whom I have written about in an earlier post, as well as the other amazing skaters from around the world. In the USA Today article, it is noted that even Michelle Kwan's dad used to leave the rink when she competed (and as you may know she is now a graduate student at the Fletcher School of Diplomacy at Tufts University in Massachusetts and is reporting on these Olympics for Good Morning America). I may have a PhD and have given talks to hundreds in audiences in different countries around the world with maybe only a few butterflies in my stomache, but there is something so surreal and challenging about figure skating that when your own child is doing those jumps and spins in the air that I just don't have the courage to watch. Luckily, my husband is tougher so he sometimes videotapes and takes photos. Needless to say, the other skating moms get a kick of me leaving the rink at those times. Plushenko trains in St. Petersburg, Russia, a magical city, which I had a chance to visit when I was there for a conference and gave an invited talk a few years back. Plushenko has gotten a lot of TV coverage and media press for his quad jump and his return to competitive skating after a few years "break." He managed to place first (but it's not over yet) last Tuesday after eating only a banana all day, he said, to stay fit and to be able to compete against the "younger ones." The drama of figure skating competition will continue tonight with the men's finals in Vancouver! I congratulate all the US gold medalists: Lindsey Vonn in skiing (despite her shin injury which was even treated by a special cheese from Austria), Shaun White in snowboarding, and Shani Davis, an African-American speed skater, as well as all the medalists at these Olympic Games! As for the fashion police (yes, academics sometimes need a break from their seriousness and their research, teaching, and service), they seem to be taking note of the figure skating costumes at these Olympics and noting the fashion "dos and dont's." Even one of our local newspapers in Massachusetts has been picking out some "doozies," which can't help but bring smiles. These skating outfits on a skating pair remind me of polyester Burberry lederhosen. Perhaps, it is best to just stick with "uniforms" but those just might detract from the originality, artistry, and much more of what makes figure skating so special (of course, there are those snowboarding outfits at the other extreme, as well). For those of you who think that I am the only mother of a figure skater who is also an academic, in fact, you are mistaken. My friend, Dr. Zelda Zabinsky, a scholar in global optimization, even used to design and sew figure skating dresses for her daughter, who is now pursuing her own PhD! My paper, Supply Chain Network Design Under Profit Maximization and Oligopolistic Competition, has now been officially published and it appears as the lead article in volume 46, number 3, of the journal Transportation Research E, pages 281-294. The mathematical model that I developed in this paper can be applied to the design of supply chain networks where there is oligopolistic competition as in such industries as: freight carriers, airlines, certain beverage (including beer) manufacturers, oil companies, and wireless carriers, among others. The competitive formalism that I utilize is that of Nash equilibrium and I show that the governing equilibrium conditions can be formulated as a variational inequality. The algorithm that I propose and apply to compute the equilibrium product flows, along with the capacities on the various links, yields closed form expressions (very elegant and easy and fun to implement). For those who are interested, you can read up on this methodology in my Network Economics: A Variational Inequality Approach book. I presented this work late last month at the Symposium on Transportation Network Design and Economics at Northwestern University, and the presentations given at this symposium have now been posted on the above link. My presentation is also available here. This symposium was organized by the Transportation Center at Northwestern in honor of the visit of Professor Martin Beckmann and I blogged in an earlier posting on the great success of this symposium. Professor Hani S. Mahmassani is the Director of this Transportation Center and he, along with Professor David E. Boyce, were instrumental in getting this symposium organized and much of the success of it is due to them. In the meantime, I received a lovely note from Professor Beckmann who wrote how much he enjoyed my fine paper. Needless to say, the fact that he took the time to write such a personal note is very meaningful to me. The first UMass Amherst INFORMS Speaker Seminar of the Spring 2010 semester is this Friday, February 19, 2010! Please join us, if you can. As the Faculty Advisor to this award-winning student chapter and its Speaker Series, I, and the chapter, are delighted to have Professor Mzamo P. Mangaliso, of the Department of Management, Isenberg School of Management, University of Massachusetts Amherst, as our first speaker of 2010! Professor Mangaliso will speak on: Research Capacity Building as a Prerequisite for the Competitiveness of a National System of Innovation: Perspectives from the National Research Foundation. Dr. Mangaliso is an Associate Professor of Management at the Isenberg School of Management, where he is a former Director of MBA Programs. His research interests focus on corporate strategy, decision-making under uncertainty, and international and comparative management. His service contributions consist of organizing and presiding over management conferences around the world; refereeing articles for international management journals and conferences, serving on editorial boards of a number of journals, and as special issues editor. He has also served on the boards of international bodies such as the Luxembourg, Austria-based International Institute for Applied System Analysis (IIASA), and as a member of the Kyoto-based Science and Technology in Society (STS) Forum. His numerous scholarly outputs have appeared in refereed journals, conference proceedings, and as book chapters. He has authored two books: A co-edited volume, Prophesies and Protests [Amsterdam: Rosenberg Publishers 2007], and Strategic Choice Under Uncertainty [Lanham, MD: UPA / Rowman & Littlefield, 2009]. Over the years, he has received numerous accolades. At UMass these include being selected as a Lilly Teaching Fellow and, subsequently, as a TEACHnology Fellow, and winning the 1999 Distinguished Teaching Award. Nationally, he is a Fellow and past President of the Eastern Division of the Academy of Management. Professor Mangaliso was inducted into the Academy of Science of South Africa (ASSAf) in 2008. From 2006 to 2008 he was the President and CEO of National Research Foundation (NRF) of South Africa. Professor Mangaliso holds a B.Sc. in Chemistry and Physics (University of Fort Hare, SA), an MBA (Cornell University), and a Ph.D. in Strategic Management (University of Massachusetts). discusses some of the key programs that were put in place, outlines the progress made towards them, discusses some of the challenges and opportunities that lie ahead, and concludes by suggesting lessons that can be learned from the South African experience. The New York Times is reporting that the number of mergers and acquisitions of energy companies is growing and that energy companies are increasingly seeking to acquire new sources for energy exploration. Companies are focusing on buying small, growing companies or on acquiring companies that expand their reserves in a period in which it is hard for them to find new places to drill. Targeted companies include companies in Africa as well as those that control drilling fields in deep waters in the Gulf of Mexico. A recent study of ours, Environmental and Cost Synergy on Supply Chain Network Integration in Mergers and Acquisitions, that I co-authored with Dr. Trisha Woolley, appears in the recent volume, Sustainable Energy and Transportation Systems, Proceedings of the 19th International Conference on Multiple Criteria Decision Making, Lecture Notes in Economics and Mathematical Systems, M. Ehrgott, B. Naujoks, T. Stewart, and J. Wallenius, Editors, Springer, Berlin, Germany (2010) pp 51-78. In this paper, we developed a multicriteria supply chain network model to assess the possible cost and environmental synergies associated with supply chain network integration as in mergers and acquisitions. This work has direct relevance to energy companies who are considering whether to acquire or merge with an existing energy company (or not). We have also (with Woolley and Dr. Patrick Qiang) developed metrics to assess the synergy associated with the supply chain network integration of multiproduct firms in the case of mergers and acquisitions. That paper, entitled, Multiproduct Supply Chain Horizontal Network Integration: Models, Theory, and Computational Results, will appear in the journal International Transactions in Operational Research. Labels: energy and the environment, mergers and acquisitions, multicriteria decision-making, networks, operations research, supply chains. As the first figure skating medals at the 2010 Winter Olympics have been announced with the gold in pairs going to Zhao and Shen, a married couple from China, I thought it appropriate to share with my readers photos and reminiscences of some of the figure skating Olympians that we have actually met. Above I have posted photos of Paul Wylie, the 1992 Olympic silver medalist in men's skating, taken at Harvard, of Sarah Hughes (the gold medalist at the 2002 Winter Olympics), after the Stars on Ice performance at the Mullins Center in Amherst with some members of the Skating Club of Amherst skaters, and of Johnny Weir with my daughter during a performance at Lake Placid in the summer of 2008, where she was training. Paul Wylie, a graduate of Harvard, has been the leader behind the An Evening with Champions event at Harvard University, which takes place each year. It is an event that raises money for The Jimmy Fund, for cancer research. While I was a Science Fellow at the Radcliffe Institute for Advanced Study at Harvard in 2005-2006, my family and I went to this wonderful event and we got a chance to speak with Paul Wylie. The inimitable Sarah Hughes, who has, since the above photo was taken, graduated from Yale University, and whose sister, Emily Hughes, is a student at Harvard and was an Olympic contender (who, unfortunately did not make the team this year) graciously posed with our local skaters for the photo above. Todd Eldridge, also a 2002 Olympian, but, unfortunately, not a medalist, also performed in the same show, and was fabulous. As for Johnny Weir, who is competing in the 2010 Winter Olympics in Vancouver, Canada, we met him in July 2008, on a rainy day, while walking on the main street in Lake Placid close to the Olympic training rinks (where the Miracle on Ice took place at the Lake Placid Games in 1980, that I have written about on this blog). Johnny Weir was walking with his mother and we stopped since he was immediately recognizable. Despite the rain, we chatted, and it was clear that the affection that he and his mother share is very special. Needless to say, when my daughter got a chance to skate in the same show as Johnny Weir, while training at Lake Placid, it was fantastic. The above photo was taken during that special performance. We wish all the figure skaters competing in the 2010 Winter Olympics in Vancouver magnificent performances! USA Today has a marvelous article on and interview with Peter Loscher, the CEO of Siemens, a high tech company with over 400,000 employees, which is 162 years old! The article notes that Loscher's leadership is based on his moral compass and that he was hired by Siemens in 2007 to clean up the corruption. His resume is incredible and he served previously as CEO of Aventis Pharma, CEO of GE Healthcare Bio-Sciences, and President of Merck Global Human Health. In the interview, Peter Loscher talks about growing up in a small Austrian village and of his father telling him to always act ethically and that being a good man will result in a good life. Today, Siemens is considered to be a role model with Dow Jones ranking the company on its sustainability world index with the highest score of 100 (when it previously had earned a 0). Loscher (there is an "umlaut" over the "o" in his name) offers this piece of advice: never miss a good crisis. Under his leadership, he certainly "cleaned house," and replaced half of Siemens' 100 top executives. He also emphasizes the importance of being trustworthy and of transparency. Peter Loscher received his MBA from the Vienna University of Economics and Business Administration, which is actually the largest business school in Europe. I had the privilege of giving a talk at this university on March 10, 2009, and was hosted by Professor Manfred Fischer, a dear friend, and scholar in regional science. The presentation that I gave was entitled, Synergies and Vulnerabilities of Supply Chain Networks in a Global Economy. My mother lived in Vienna during part of World War II, as did one of my uncles, so it was very special to visit and to speak at this renowned institution. Clearly, the Vienna University of Economics and Business Adminsitration is doing an outstanding job of educating leaders, as evidenced in Siemens CEO, Peter Loscher. Plus, having had a Distinguished Chaired Fulbright in Innsbruck, Austria, I welcomed a return to that gorgeous country. Of course, it was also wonderful that my Fulbright experience resulted in the matriculation of an Austrian student, Tina Wakolbinger, at the Isenberg School of Management at UMass Amherst. Dr. Wakolbinger became my second PhD student from Europe (with Dr. Stavros Siokos being my first). Dr. Wakolbinger, as Peter Loscher, comes from a small village in Austria, and she is now a Professor at the Fogelman College of Economics and Business Administration at the University of Memphis in Tennessee. A Humanitarian Logistics Service Corps -- Let's Dream and Do It! In two OpEd companion pieces in The New York Times, Matt Klapper and James J. Riley argue for a search and rescue corps for disaster relief, and Dr. Vanessa Bradford Kerry, the daughter of Senator John Kerry of Massachusetts, argues for a new international service corps of medical professionals to assist in humanitarian operations relief, also post disasters. These two service corps ideas are outstanding but another crucial element of this complex disaster relief network is missing. Hence, I would add that we need to dream bigger dreams and to include a missing piece. We need to envision and to build a humanitarian logistics service corps. Without timely and effective humanitarian logistics operations man and material do not get delivered to points of demand, as what was dramatically demonstrated in the post-earthquake disaster of Haiti and numerous others disasters. Indeed, doctors had to do amputations with hacksaws and to disinfect wounds with vodka and operate without anesthesia. Many medical professionals continue to be traumatized after conducting their medical procedures and more lives could have been saved. They did not have the supplies at the appropriate time that effective logistics would have given them. 4. it would provide opportunities for partnerships with stakeholders, including corporations, to develop technologically-enhanced tools for logistics operations. This service corps could then lend its expertise during periods of relative serenity to assist needy communities in food distribution, n humanitarian support, and other appropriate service activities. Education would be a critical component of the humanitarian logistics service corps. Read here how desperately Haiti's education infrastructure was affected by the calamitous earthquake. I can envision which professional societies and organizations could help to spearhead such a service corps and would single out both IFORS (the International Federation of Operational Research Societies) and INFORMS (Institute for Operations Research and the Management Sciences). The funding for such an effort might be provided by relevant foundations, corporations, private and public institutions, humanitarian organizations, and, perhaps, some governments. The expertise gained by members of such a humanitarian logistics service corps could then be applied outside this sector, since effective production and supply, combined with the effective movement of goods and services to points of needed demand for delivery in a timely manner, are what makes economies work! Finally, Canada did it and acquired its first gold medal ever in a Winter Olympics in Canada! Canada has been the site of several Winter Olympics from Montreal to Calgary and now Vancouver but until yesterday it had never won a single gold medal in a Winter Olympics that it had hosted. The Canadian gold medalist who yesterday made history for Canadian sports is Alexandre Bilodeau who won the gold in mogul skiing. The New York Tmes reports on this wonderful, and much deserved, victory (my family was breathless when we watched on television as Bilodeau skied in the finals). As some of you may have heard, Bilodeau said that he was skiing for his older brother, who has cerebral palsy, and who managed to learn how to walk and even ski despite many odds. What an uplifting, Olympic story and victory! Congratulations to Alexandre Bilodeau, to his family, and to Canada! All great things are worth waiting for. I am cheering for many countries and all athletes at these Winter Games. Having been born in Canada, I can't help but feel a closeness to Canada and its majesty of scenery, size, and specialness. Ohno, Oh Yes -- Speed Skating at the Olympics! I was contacted by teamusa.org to blog about the Olympics, an invitation that I did not officially accept, but a topic that I cannot resist to be following and writing about. In today's world, what is local is global and vice versa. Yesterday, we dined at one of our favorite restaurants in the Pioneer Valley, Mr. Kim's (Gohyang) Restaurant in Hadley, which is a Korean restaurant. It is owned by a family whose father has a PhD in sports management from UMass Amherst and whose daughter attends my daughter's fabulous school, Deerfield Academy. The dad also has a faculty position in South Korea but was visiting his family while on break so we got to chat with him. After dinner and some walking to digest the delicious Korean meal, we proceeded to catch up on the 2010 Winter Olympics events. Apolo Ohno did it again, and received a silver medal (tying his record number of Winter Olympic medals with Bonnie Blair) and he did it with his amazing athleticism, flair, and drama. The New York Times had a terrific article on this event which resulted in two American athletes standing together on the awards podium, along with the gold medalist from Korea. Yes, there was a roller derby type of crash that took place at this event but it is these kinds of unexpected events that make the Olympics so fascinating to follow! As for another UMass connection, Michael Corey, a UMass Amherst grad from 1999, who is also the voice of the University of Delaware, has been announcing the speed skating Olympic events. For those of you who have been wondering how a local Western Massachusetts bus company has been doing at the Olympics in shuttling the athletes (something I wrote about in an earlier post) I am pleased to report that Travel Kuz has been doing great in Vancouver and there was recent coverage in the Springfield media. As I had mentioned in an earlier post, as well, the grandson of the owner of this bus company and my daughter were classmates for years at the terrific elementary school, The Bement School, in Deerfield, Massachusetts. He continues to play hockey and my daughter to figure skate, among other numerous activities. These Olympics, however,were marred by a tragedy, the death of the luger, Nodar Kumaritashvili, from Georgia, at age 21, and we extend our deepest condolences to his family, friends, and coaches. Georgia is a country that borders Ukraine, where my parents came from, and my first language is Ukrainian, which I learned growing up as a child in Canada. The Georgian Olympic delegation received a standing ovation at the Olympic opening ceremonies as they marched in wearing black armbands to commemorate the untimely, tragic death of their luger during a training run. The Cybersecurity Research and Education website at UMass Amherst is featuring the award that my most recent to graduate doctoral student, Dr. Patrick Qiang, received at the Council of University Transportation Centers (CUTC) in Washington DC last month. Dr. Patrick Qiang received the Charles V. Wootan Award from the Council of University Transportation Centers for his doctoral dissertation, Network Efficiency / Performance Measurement with Vulnerability and Robustness Analysis with Application to Critical Infrastructure. He received this national dissertation award, which is given for the best doctoral dissertation in the transportation planning and policy. More information on other award recipients from the CUTC can be found here. We congratulate all the awardees and their mentors for their terrific hard work! Dr. Qiang has won additional awards, including the INFORMS Judith Liebman Award in 2009. He is actively involved in the profession, as he was the President of the University of Massachusetts Amherst Student Chapter of INFORMS from 2007 to 2008, and is an active member of INFORMS and the Decision Science Institute. Dr. Qiang joined the faculty of Penn State Great Valley in 2009. At Penn State Great Valley, he has taught Operations Management, a core course for all MBA students. Dr. Qiang is the co-author with Professor Anna Nagurney, who was the chair of his doctoral dissertation committee, of the book, Fragile Networks: Identifying Vulnerabilities and Synergies in an Uncertain World, John Wiley & Sons (2009). Dr. Qiang is a Center Associate of the Virtual Center for Supernetworks at the Isenberg School of Management. In an article in the European Journal of Operational Research (EJOR), entitled, "Optimizing the Marriage Market: An Application of the Linear Assignment Model," researchers based in Switzerland and England have developed a mathematical model whose solution yields a new social optimum as to who should be married to whom based on a longitudinal dataset in Switzerland. I thought that this article (and associated research) was provocative and fitting given that we are celebrating Valentine's Day on February 14. The article appears in the April 2010 issue of EJOR, volume 202, pages 547-553. I read the article and thought that it was very interesting how the authors identified the appropriate weights to assign and how they assumed a central agency that would reassign the couples so as to achieve a better optimum. Interesting that, according to their study, they found that the existing marriage pairings using the dataset in Switzerland was very fair from optimal. The objective functions that the authors considered corresponded to age, education, ethnicity, and prior divorce history. The media coverage surrounding the publication of this article has also been fascinating. See here for an article from the British Daily Mail. I teach the assignment model and algorithm when I teach Management Science since these are classic operations research type problems. It is interesting to see extensions of the basic model developed and fitted to sociological longitudinal data. It's never dull to be keeping up with the scientific literature and, actually, it can be a lot of fun, as well, in addition to thought-provoking. There are not many existing societies in which such a top-down, central allocation, system-optimizing mechanism would be favorably accepted by the citizens, however! The Innovation Forum on Operational Process Improvement in a Changing Manufacturing Supply Chain took place yesterday at the Isenberg School of Management. This forum was the first such forum (and I hope that it is not the last) at the Isenberg School, and was organized to support the Precision Manufacturing Regional Alliance Project (PMRAP). The forum brought together faculty from the Operations Management group and Marketing at the Isenberg School and a faculty member from Regional Planning at UMass Amherst to brainstorm with presidents of several high precision manufacturers in the region, manufacturing directors, sales managers, and a foreman. The project manager of PMRAP, the engineer, and the Director of Cluster Development, as well as a PMRAP consultant, who served as the discussion facilitator, also took part. The Vice Chancellor of Research and Engagement at UMass Amherst also stayed for the entire forum as did a rep from the John Adams Innovation Institute. The faculty members then overviewed their relevant research, in light of what the industry representatives had identified as their major issues and concerns. The goal was to identify how research could help the industrial partners and how common areas of interest and expertise could create synergies. I was one of only two females at the forum, which attracted about two dozen participants, the other being a president of a local manufacturing company, who graduated from UMass Amherst and whose daughter graduated from the Isenberg School! The high precision manufacturing companies represented at the forum were a diverse group, based on size, number of competitors, etc. Their common themes were: high precision manufacturing, regional proximity, similar economic pressures, with all facing a new dynamic decision-making environment with a lot of uncertainty. Possible research questions that arose were numerous and I truly enjoyed the free exchange of ideas amongst the faculty and industry reps, which highlighted such topics as lean manufacturing, collaborative networks, adaptive and agile supply chains, R&D portfolio optimization, the evolution and dynamics of innovation networks, relationship and trust management, identifying synergies among partnerships, the integration of social networks and supply chains, capacity planning, process optimization, decision-making under uncertainty and robust optimization, optimal vendor consolidation, and even branding the region as one with highly skilled workers, including machinists and manufacturers. I had brought several of my recent books to the forum, including the Fragile Networks book, co-authored with my former student, Dr. Patrick Qiang, and my Supply Chain Network Economics book, written while I was a Science Fellow at Harvard University. What also very much impressed me besides the communications and ideas that were exchanged was the clear excellence in the leaderships of the various companies that took part in the forum. I heard of companies being like families, of the importance of human resources in the supply chain (I completely concur), and of employees working as a team with employees acquiring additional skill sets, which enable them to become more productive and to create additional value to the company. I enjoyed a newly learned acronym - IDIQ, which stands for indefinite demand, indefinite quantity, and that is the reality for some of the industries that these high precision manufacturers supply -- from aerospace to defense, for example. Researchers in supply chains enjoy challenges, and the forum yesterday certainly brought a fascinating spectrum of relevant topics for further discussion and for research! Some background on the PMRAP initiative can be found in this press release that was issued by UMass Amherst. There has been further media coverage on this initiative, which is supported by a two year $650,000 National Science Foundation grant, in Business West, among other publications and media outlets. According to The New York Times, the New York Traffic Experiment Gets Permanent Run! 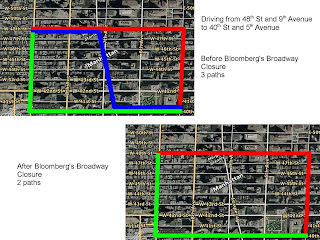 The road closure(s), which banned vehicles on Broadway from 47th to 42nd Streets and from 35th to 33rd Streets, was pitched last February as an innovative way to fight congestion. It quickly became a fascination for tourists and New Yorkers alike, drawn to the curious sight of a pedestrian mall, complete with picnic tables and folding chairs, under the neon lights. The article states that Mayor Bloomberg was more trusting of separate data collected from GPS devices in yellow cabs. Those numbers encompassed 1.1 million Midtown taxi trips taken between Fifth and Ninth Avenues in Midtown. Of those trips, northbound travel times improved by 17 percent, and southbound trips slowed by 2 percent, but a street-by-street breakdown could not be calculated. This network redesign, if I may call it, was discussed on the Traffic panel that I was part of last June in New York City as part of the World Science Festival, which was tremendous fun. The above graphics were prepared for that panel. 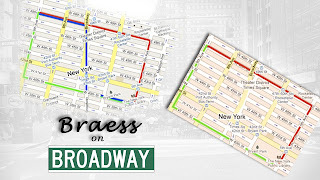 The closure of that segment of Broadway would be representative, as I depict above, of the reverse of the Braess paradox (in which the addition of a road makes all travellers worse off in terms of travel time due to selfish or user-optimizing, as opposed to system-optimizing behavior). You can read up on the paradox and Professor Braess on the Virtual Center for Supernetworks site. Of course, one has to realize that midtown Manhattan and its streets are subnetworks of a much larger transportation network with multiple origin/destination pairs of associated demands which vary dynamically over the day and the night. Nevertheless, this initiative by Mayor Bloomberg demonstrates how the science of traffic flow and associated congestion management tools can be implemented in the real-world and what could be more dramatic than doing this right in the heart of NYC! The Olympic torch and let the 2010 Winter Games begin! Today the 2010 Winter Olympics Games begin in Vancouver, Canada. 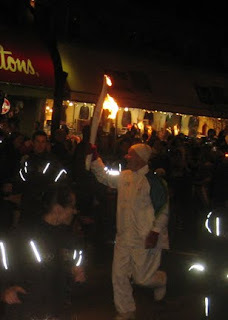 Our dear friends, the Wassermans, sent us the above photos of the Olympic torch which went by just 2 blocks past their home the other night in Vancouver. They are celebrating the beginning of these Winter Olympics as is the rest of the world! We wish the athletes, their coaches, family members, and supporters a terrific Olympics with athleticism, friendships, harmony, spectacle, and beauty! Thank you, Canada (my birthplace), for hosting these Olympics! Let the 2010 Winter Olympic Games begin! The Intemational Telecommunications Union (ITU), the oldest organization in the United Nations, is leading the efforts to rebuild the communications infrastructure in Haiti post the devastating earthquake. This effort is being led by Dr. Cosmas Zavazava of the ITU, who was a speaker at the Humanitarian Logistics conference that I organized under the auspices of the Rockefeller Foundation's Bellagio Center program. Above is a photo, taken at the conference at the Bellagio Center in Italy, of me with Dr. Cosmas Zavazava and Professor Panos Pardalos with several conferees who have become dear friends and colleagues and who are from the African continent. This article discusses how the UN is making plans for Haiti's future with the building of a strong communications infrastructure as it continues to play a pivotal role in supporting humanitarian and relief efforts in Haiti. Dr. Zavazava is quoted as saying: Our aim is to help Haiti mobilize and deploy different kinds of technologies to mitigate the impacts of disasters. Reliable telecommunication systems can be complemented with remote sensing and GIS [geographic information systems] technology. In disaster management, a hybrid of these technologies is important. In addition, Dr. Zavazava believes that: Haiti needs a lot of assistance. Even before the earthquake, it was one of the least developed countries in the world. It will need a strong infrastructure to run e-business, e-agriculture, e-environment, e-education, and e-health efficiently. E-applications and e-services are a critical ingredient to today’s results-based business model. I salute the extraordinary efforts of Dr. Zavazava and his colleagues from the ITU! Spring 2010 Speaker Series in Operations Research / Management Science Begins Next Week! Professor Mzamo Mangaliso will kick off our Spring 2010 Speaker Series in Operations Research / Management Science next week on Friday, February 19. His talk will take place at the Isenberg School of Management at UMass Amherst in Room 112 at 11AM. This Speaker Series is organized by the award-winning UMass Amherst INFORMS Student Chapter, which I have been a Faculty Advisor of since Fall 2004. This is the twelfth semester of the Speaker Series! Please join us, if you can, to learn about such important topics as research and scientific innovation and nation building, smart grids, financial optimization, vaccine stockpiling, robust optimization, and supply chain disruptions. Complete information about all the upcoming speakers, their presentation titles and abstracts, can be found here. This Speaker Series is supported by the Department of Finance and Operations Management, the Isenberg School of Management, and my Smith Fund (my chaired professorship fund). This semester the visit and talk of Professor Sheldon Jacobson of the Department of Computer Science at the University of Illinois at Urbana will be funded, in part, through the INFORMS Speakers Bureau and I thank INFORMS very much for this sponsorship! I would also like to take this opportunity to thank the Officers of the UMass Amherst INFORMS Student Chapter for their outstanding work in organizing this Speaker Series and for their other very collegial and professional chapter activities. Last year, I began this blog about the same time as my daughter, who was then a 9th grader at The Bement School in Old Deerfield, Massachusetts, was getting ready for a community service trip with her class to La Suiza Orphanage in the Dominican Republic. I wrote in this blog about the preparations, the anticipation, and the excitement of the students and their teachers prior to the trip and the life-transforming experience that this trip was for all involved. Much has happened to the island of Hispaniola, which is shared by the Dominican Republic and Haiti, since that class trip, especially the devastating earthquake that hit Haiti on January 12, 2010. This year's 9th grade class at The Bement School has now returned from their one week service trip to the same orphanage, which began on January 28, 2010. Before they left, my daughter constructed a large poster filled with photos that she developed from her class trip last year and one of her former teachers brought the poster to the orphanage. 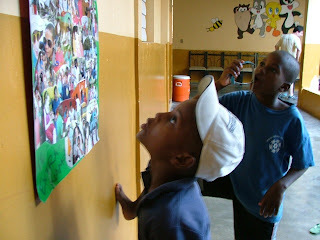 Above I share with you a photo that the teacher took of my daughter's poster at the orphanage, which is being admired and studied very intently by two boys at the orphanage. The teacher told my daughter that many of the children at this orphanage remembered their experiences with my daughter's class and were delighted to see the poster with the photos of very special memories. A return trip is planned next year for the Bement alums who have been able to help out at La Suiza and who wish to return to see the children and to reestablish the bonds made. Memories of such experiences as these are priceless for all those involved and prove the importance of human connections and community service across national boundaries. The Cybersecurity Website is Now Live! The Cybersecurity website that details the breadth and depth of research and education activities at UMass Amherst on this topic is now live. We are delighted with this important initiative that includes faculty and students from such outstanding departments and schools at UMass Amherst as: Computer Science, Electrical and Computer Engineering, Civil and Environmental Engineering, Mathematics and Statistics, Political Science, Communications, and the Isenberg School of Management. You will find on this site more information about the various campus-wide activities, including the relevant research that we have been conducting at the Virtual Center for Supernetworks on the Modeling, Analysis, and Computation of Solutions to Complex Network Systems. Last term, as part of the UMass Amherst INFORMS Speaker Series in Operations Research / Management Science, we hosted the presentation of Professor Brian Levine of the Computer Science Department on cyber forensics (which the audience members are still talking about). This term, the upcoming talk of Richard Brooks on smart grids is also relevant to cyber security. We are looking forward to further supporting the important research and education efforts on this most important topic and are glad that we were able to support financially, in part, the development of this website. I was pleased to see James Parker's column in the Boston Globe on queuing, which he says is what separates man from beasts. He gives credit to anthropologists for noting that queuing represents stable cooperative equilibrium and then goes out to note the Braess paradox, due to Professor Dietrich Braess, which showed that the addition of a new road may make everyone worse off in terms of travel time in the network. However, in the column he misrepresents the Braess paradox by saying that it reflects that two lines are shorter than a single line or queue. In the Braess paradox, the addition of a new road results in multiple roads or links then being shared and these are not parallel roads of different lengths. For the exposition of the Braess paradox, along with links to the original Braess article, which was published in German, as well as to the translation to English, which Braess and I did with my former doctoral student, Tina Wakolbinger please click here. We had the pleasure of hosting the visit of Professor Braess at the Isenberg School of Management at UMass Amherst in April 2006. 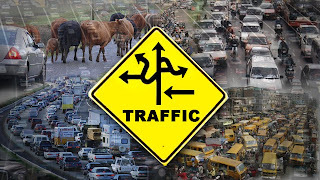 Of course, if one can control the flow of traffic then such a paradox cannot occur. It also does not occur in the case of uncongested networks in which the travel time of the link is independent of the flow on the link. Last week, when I was at the Transportation Network Design and Economics Symposium at Northwestern University, I asked Professor T. John Kim of the University of Illinois at Urbana what he thought of the removal of the downtown arterial in Seoul, Korea, to recover the river and to restore the surrounding parks. Professor Kim had, of course, visited that part of Seoul and had discussed the matter with the civil engineering professor who had done the study prior to this road removal (like the reverse of the Braess paradox). He and others consider this road removal a great success. The New York Times last week ran an article on the closure of Broadway between 47th Street and 42nd Street and the full analysis of the impacts on the traffic flow and travel time should be out fairly soon. In any event, the closure of Broadway appears to have had a similar effect to that of congestion pricing in London. Queuing is a topic well-known to operations researchers and management scientists so I was pleased to see this topic featured in the Boston Globe. I was in Boston and Cambridge this past week where the roads and streets were clear of snow, unlike the Washington DC area, which is being pummeled by a huge snowstorm that has grounded travel to a halt. Having spent a year as a Science Fellow at Harvard in 2005-2006 at the Radcliffe Institute for Advanced Study, I like to go back fairly regularly. Cambridge and Boston are two magnificent locations in my state of Massachusetts and I get my muse in those places (among others). While in Cambridge, I met the Executive Director of the Latin America Research Center of the Graduate School of Business Administration at Harvard University, who is based in Buenos Aires, Argentina. Buenos Aires is the venue for the ALIO-INFORMS Conference that is taking place in early June, 2010. At the conference, I will be giving a tutorial, Fragile Networks: Identifying Vulnerabilities and Synergies in an Uncertain Age. Additional tutorial topics and plenary lectures can be found here. The New York Times had a recent article on Buenos Aires which highly recommended it as a fascinating destination. At the ALIO-INFORMS conference, which will bring operations researchers and management scientists from around the globe to discuss their latest research, I will also be taking part in a panel on International Collaborations, a topic that I have been writing about on this blog recently. The panel is organized by WORMS, Women in Operations Research and the Management Sciences, a fora of my professional society INFORMS. The convener of this panel is Dr. Sadan Kulturel, a Professor at Penn State Berks. Joining me on the panel will be: Drs. M. Gulnara Baldoquin, Karla Hoffman, and Lorena Predanas. The panel will focus on different means of international collaborations such as funded projects, international research and teaching projects, sabbaticals, etc. The panelists will discuss their unique perspectives on issues affecting the success of women in academic positions in the US and in Latin American countries. I am very much looking forward to being on this panel, giving my tutorial, and to going to the ALIO-INFORMS conference. Above I share with you some photos of the intellectual capitals of the universe (Boston and Cambridge) taken this past week (including photos of Harvard Yard and Radcliffe Yard, with a recent sculpture, and where I had my office as a Science Fellow). I could not resist also including a photo of the bronze sculptures of the ducks made famous in the book, Make Way for Ducklings, on the Boston Common. Note the absence of snow although it is February!